Simplicity and Essentiality. 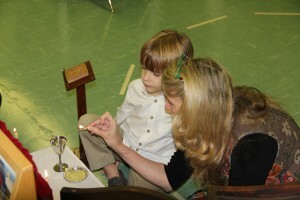 The Liturgy and the art of catechesis with Children. This blog continues our reflection on the methods and ideas of the Catechesis of the Good Shepherd. The Eucharistic service in the Book of Common Prayer has a central and meaningful place in the Atrium. The word “liturgy” has it’s roots in secular classical Greek. It meant a “public work” that was undertaken on behalf of the “people or community.” When we look in the Bible in the Old Testament the word “liturgy” refers to the divine worship and ministry of the Levite priesthood. In the New Testament, in the Letter to the Hebrews, for example, it referred to the priestly work of Jesus Christ. St. Paul in his Letter to the Romans refers to his own priestly ministry among the Gentiles in this same way, as a priestly service. For the early Christians they used the word “liturgy” to illustrate their belief that the worship of God in Christ was done for the benefit of all people and the world. Liturgy for them meant primarily the celebration of the Holy Eucharist. The Mass was the Lord’s way of bringing His passion and cross to bear upon every generation. Jesus becomes our food and our life. When the Church celebrates the Holy Eucharist she fully becomes the body of Christ. In his book, “For the Life of the World”, Fr. Alexander Schmemann explains the Eucharistic liturgy in this way. He writes that by means of the Eucharistic “leitourgia” the baptized “become something corporately which they had not been as a mere collection of individuals, [leitourgia makes] the whole greater than the sum of it’s parts.” (p 25). Liturgy allows us to become the Church in the world. The Church gathered at Eucharist become the chosen instrument of God’s grace and purpose, acting after the fashion of Christ. This worship enables the Church to become God’s sacrament in the world. The language of the liturgy helps to unfold the living reality of the new era of Christ’s victory into our day and time. The Holy Eucharist, in its entirety, from beginning to end, is God’s “epiklesis,” that is, His “coming down” of the Holy Spirit to bless and sanctify. So, what is this blog addressing with regard to children? First we are acknowledging that children truly experience God through the liturgy in beautiful ways. They experience the sacramental reality of Christ. The second is that this capacity is due in part to children’s ability to make sense of the simplicity and essentiality of liturgy and faith. When children experience God in this way they are being catechizing at the deepest levels where the soul can connect to God. Children discover that God builds a lifelong relationship with them through the liturgical and sacramental life of the Church. Our Anglican liturgy in the Book of Common Prayer provides this organic catechesis for our children. This is one reason why the Eucharistic liturgy plays such an important role in the Catechesis of the Good Shepherd. When working with children it’s important for the catechist to stay focused on the simplicity and essentials of the liturgy. This clarity of focus requires demanding preparation on the part of the catechist. It’s so easy to “talk over the heads” of children (and adults) or to “dumb things down.” To avoid this the catechist must maintain clarity. Otherwise essentials can be lost in secondary actions and words. Sofia Cavalletti writes, “I want to affirm the conviction that simplicity is found in the elementary and that the greatest of realities are simple and essential. Simplicity and essentiality are inseparable and are characteristic of what is most profound. Is there anything simpler, more essential, than a morsel of bread, a few drops of wine? And yet, it is by means of these that the Christian community lives its greatest realities. It is through simplicity that we attain profundity. (1) The liturgy of the Word of God contains an introductory portion, extensive reading of holy Scripture, the sermon, the Nicene Creed, prayers, confession of sin and sacramental absolution, and the exchange of peace. Anglican worship is rooted in God’s Word proclaimed and taught. When it is time to read from the Holy Gospel we actually carry it out to the middle of the congregation to proclaim the words of Christ. The choir sings a gradual hymn, our acolytes carry torches and the processional Cross all to lead the Holy Gospel into the midst of the people for the proclamation. This is done to share our belief of the presence of the living Word of God, Jesus Christ, in the midst of His family gathered. (2) The second half of the service is the liturgy of the Altar, or Holy Communion. This consists of the offertory, the Great Prayer of Consecration, the communion of the people of God, the post-Communion prayer, and the blessing and dismissal. Through the ministry of the priest we gather with Jesus at the “Last Supper.” This liturgy of the Mass enshrines our Lord’s actions of taking bread and wine, blessing both, breaking the bread and pouring the wine to give His sacred Body and Blood to the Church. During Holy week on “Maundy Thursday” night our Lord commanded the apostles to preserve these four sacred actions of taking, blessing, breaking and giving. What is preserved in the Church is our Lord’s holy death on the Cross and His resurrection to glorification. The lasting value of Anglican worship using the Book of Common Prayer does not depend on the clergy or anyone present. It depends solely on Jesus Christ who is the true Priest and Victim. With Him we are united, in spite of our nothingness. We offer Him our intellect and our will, our heart and our soul, our body and our blood, so we may be filled with grace and heavenly benediction, and made one body with Jesus, that He may dwell in us, and we in Him. Our heavenly Father knows us not so much due to our imperfections, but rather He knows us in His beloved Son in whom He is well pleased. At St. John’s our worship lifts high the Cross between Heaven and earth so Christ may bestow the fullness of forgiveness and the supernatural life. Choral Evensong will be celebrated on November 1st, being the Feast of All Saints, at 7:00 pm. Please join us! Holy Scripture calls Christians to pray. St. Paul tells the Church in Thessalonica to “pray constantly,” (1Th 5:17). St. Jude writes in his letter “But you, beloved, building yourselves up on your most holy faith; praying in the Holy Spirit;” (Jud 1:20). Choral Evensong is a beautiful part of Anglican worship. Choral Evensong is offered to God by His people in every part of the world. When you come to Evensong you are stepping into unceasing prayer. 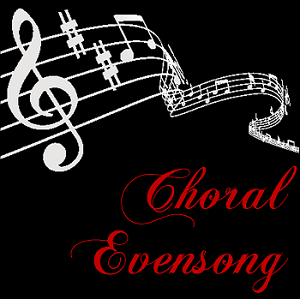 Evensong is a beautiful way to close the day, whether the service is held on Sunday evening or in a mid-week evening. We spend time in prayer, examining the day past while listening and participating in music that is especially selected to bring us into deeper understanding of the mysteries of our faith. What should I expect at Evensong? Hymns, Scripture readings, Anglican chant and anthems sung by the choir. Will there be a sermon? No. Why does the choir sing so much at Choral Evensong? In Choral Evensong the congregation sings hymns and some service music. The choir sings settings of the Canticles: the Magnificat and the Nunc Dimittis. The petitions of prayer and the people’s responses are sung between the clergy officiating and the choir with the people joining. In addition to the singing of the hymns, the Choir sings the Apostle’s Creed and the Lord’s Prayer. How will I know what I should do during the service? A booklet outlining the service will be available. When Evensong falls on a Sunday afternoon St. John’s provides a reception following Evensong? As important as it is for us to have time to reflect and ponder the mysteries of our lives, it is also important that we have fellowship with those in our community. The reception gives us a chance to talk and share with those who have celebrated with us. The Handbell Choir performed on Sunday, March 24th at the 11:15 am service at St. John’s. Enjoy.